Slitting is a converting process where logs or master rolls of material are cut to custom widths and lengths. Due to availability and minimum order quantities (MOQs) from suppliers, materials are often supplied in large width and lengths. These large sized rolls make it difficult to move, handle, and use the material without using forklifts and other heavy lifting machinery. Our slitting division converts these large rolls into custom width packaged rolls or smaller sizes that can be used on press for precision die cutting. Logs of material can come as wide as 60”. We slit these down to widths as narrow as 1/16” with tolerances as low as ±.03”. Master logs of tape can be as long as 15,000 feet. Rolls of tape this long are not practical for automated equipment or hand use because of their extreme proportions. We can slit the material to custom width and wind it on a roll in custom lengths so that the material is more practical for your use. 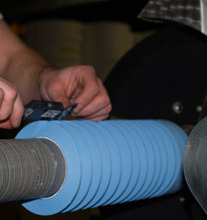 Do you like the idea of long rolls of tape but the large diameter of these rolls gets in the way of your automation equipment? If so, spooling is the perfect solution for you. 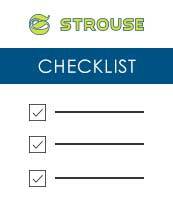 Strouse provides precision slitting services to customers who want rolls of material in custom lengths and widths. Contact us today if you’d like to learn more about slitting and how custom width materials can improve your processes.